Open your Zopto account within minutes, to start automating your LinkedIn outreach and generate sales leads and opportunities. Once Zopto campaign has started, you can then expect dozens or even hundreds of Hot leads per month, all generated on auto-pilot. Zopto is mainly used by sales teams to automate their LinkedIn lead generation efforts, however due to the combination of various engagement features, it can also be used by startups to attract investors or even by recruiters to find potential candidates. The benefits of integrating Zopto into your lead generation process can add immense value to your pipeline. You'll be able to not only automate your lead generation process but also to acquire customers outside of your network and enter new markets within days. 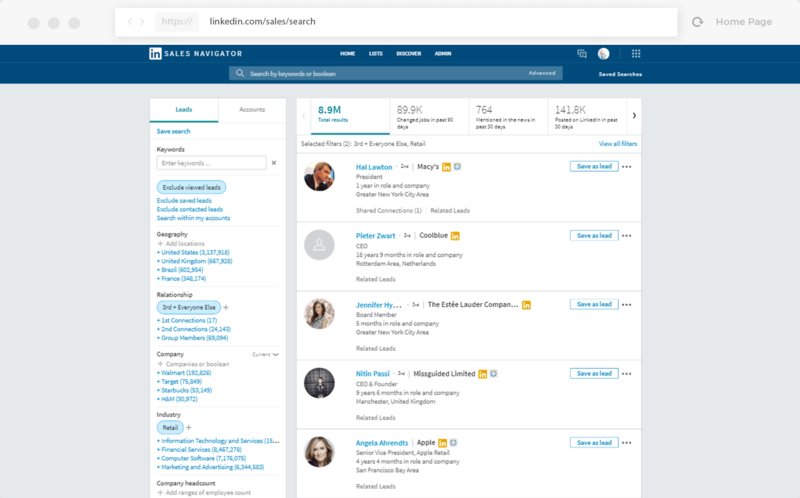 Once you've successfully activated Zopto, you can start searching for your ideal customers using LinkedIn Premium or Sales Navigator. You'll be able to filter by Location, Industry, Company size, Title, Seniority Level, Technology that the company uses, Number of followers and much more. 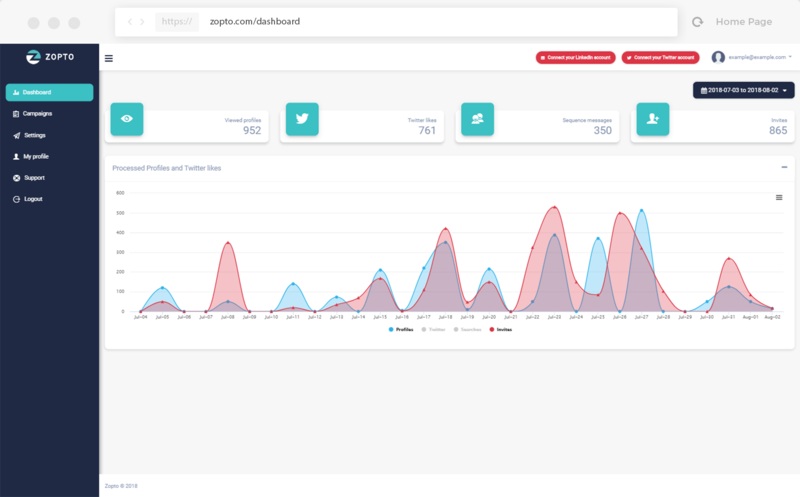 Once you've completed Zopto's 2 minute setup and also decided on the level of automation and engagement, you can now start running Zopto and expect to receive the first leads. Now that you have fully automated your LinkedIn lead generation using Zopto, you can expect to see the first results within days and depending on the desired outcome and campaign settings, numerous conversations and Hot Leads will be generated on auto-pilot, filling your LinkedIn inbox. You also have access to a live dashboard, which will provide you with detailed information and statistics related to your LinkedIn lead generation campaigns. Since Zopto is a cloud-based software, that means you are no longer dependant on your device or internet connection and you can now fully automate your LinkedIn outreach campaigns. Do I need a LinkedIn Premium account to use Zopto? You can test Zopto using a Free LinkedIn account however because the number of your profile views and profile searches will be limited on a free account, you will need to upgrade to a paid LinkedIn account to fully benefit of Zopto features. We recomend LinkedIn Sales Navigator as the filtering options are superior to LinkedIn Premium. There is no long term commitment with Zopto. You can upgrade, downgrade or cancel at anytime. Upgrades and downgrades take effect immediately. The new monthly rate begins at the start of your next billing cycle. What languages does Zopto support? Zopto has no limitation on the language of your LinkedIn account or the language that you use to connect with prospects. How is Zopto different than other tools? 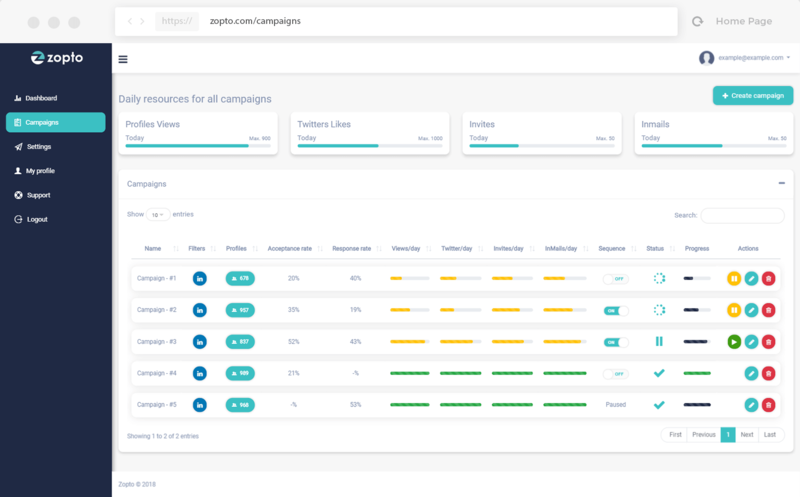 Zopto is not another Chrome extension that you need to install in your browser, but a cloud-based software that allows you to fully automate your LinkedIn outreach campaigns, without being dependant on your device or internet connection. GDPR doesn't affect the LinkedIn outreach and messaging campaigns so whilst your other marketing communications could be severely curtailed, Zopto ensures that you can run fully compliant campaigns. Can I run Zopto on multiple LinkedIn profiles? 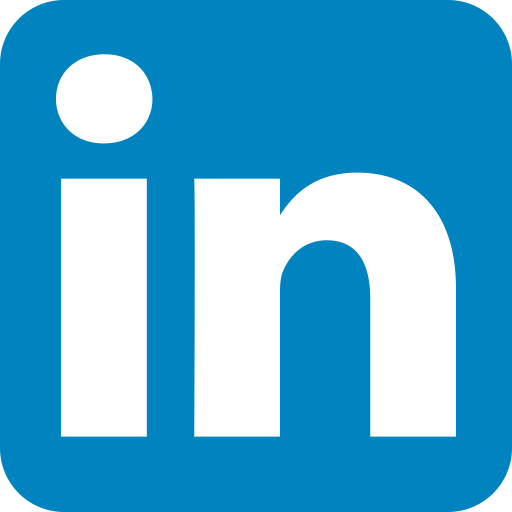 When you activate Zopto, you'll be asked to link your Zopto account with your LinkedIn one. If you are interested in running Zopto on multiple accounts, please inquire about available options, discounts or agency plans. Can I white label Zopto? Yes, we offer a white label solution for agencies that have more than 10 active accounts. Please contact us to discuss agency plans and available discounts.